This article submitted by Linda Stelling on 10/20/98. The students had their pick of activities from about 25 exploratories. Leading the exploratories were teachers, various staff members and volunteers from the public. Students had the opportunity to learn about different sports from tennis to rollerblading, golf, goose hunting, trap shooting, fishing, horseback riding, water skiing, biking on the Spicer trail or aqua aerobics at the Country Inn. Other students put their art talents to the test to carve intricate designs in pumpkins, make candies, do charcoal drawing, rubber stamping and make cards and warping paper, design and paint the windows in the hallway and entry for the Halloween holiday, make figurines and bowls with clay, and make cloth photo albums. Still other students built car, truck and motorcycle models, made Halloween crafts such as ghosts and pumpkins from cloth and plastic hands filled with popcorn. The students in the Paynesville Area Middle School left their text books and papers behind and headed out into the community. 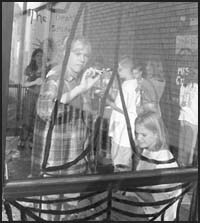 The students raked leaves, washed windows, cleaned up debris in yards, moved bricks, dusted trophy cases, picked up trash around buildings, put away summer lawn furniture, and inserted light bulbs in the new snowflake Christmas decorations. 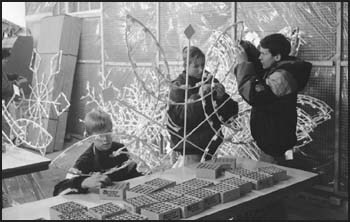 The group working with the light bulbs were able to complete 30 of 47 snowflakes. The middle school students helped out at more than 35 homes, the Paynesville Area Senior Center, Paynesville Area Community Service Center, Chamber of Commerce, Good Samaritan Care Center, and at the various schools.